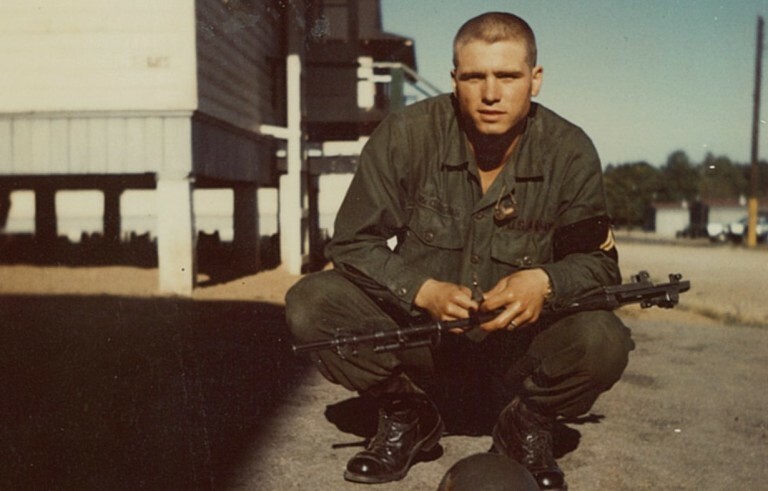 On July 31, 2017, President Donald J. Trump awarded the Medal of Honor to former Specialist Five James C. McCloughan, U.S. Army, for conspicuous gallantry during the Vietnam War. McCloughan received the Medal of Honor for distinguished actions during 48 hours of close-combat fighting against enemy forces near Don Que, Vietnam, from May 13 to 15, 1969. McCloughan was serving with Company C, 3rd Battalion, 21st Infantry Regiment, 196th Infantry Brigade, Americal Division, as a private first class combat medic. McCloughan, then 23 years old, voluntarily risked his life on nine separate occasions to rescue wounded and disoriented comrades. He suffered wounds from shrapnel and small arms fire on three separate occasions, but refused medical evacuation to stay with his unit, and continued to brave enemy fire to rescue, treat, and defend wounded Americans. McCloughan was drafted into the Army after graduating from Olivet College with a Bachelor of Arts in sociology and a teaching certificate. After Vietnam, McCloughan returned home and spent nearly 40 years teaching and coaching sports at South Haven High School in Michigan. McCloughan taught psychology, sociology, and geography and coached football, wrestling, and baseball. He also earned a Master of Arts in counseling and psychology in 1972 from Western Michigan University. McCloughan is a member of the Michigan High School Coaches Association Hall of Fame; the Michigan High School Football Association Coaches Hall of Fame; the Michigan High School Baseball Coaches Association Hall of Fame; and the Olivet College Athletic Hall of Fame. He is married to Chérie McCloughan and has two sons, Jamie and Matt, one daughter, Kami, and one stepdaughter, Kara.